You know how the saying goes: the tan lines will fade, but the memories of all the incredible live music you're about to see won't. As with every year, the beautiful summer months have flown by so far and here at New York State Music, we are determined to make sure you make the most out of the sunshine left. If you are looking to pack the whole month of August with unforgettable performances at great venues throughout New York, look no further than this cheat-sheet of all the upcoming action. Nietzche’s has been beating those Monday blues all summer long by making Happy Hour a lot more jazzy for Buffalo. If you have not made your way to Jazz Happy Hour this summer, be sure to get there before August is over. August 6th – Well-rounded vocalist Kristen Smigielski will be treating the crowd at the first Happy Hour of the month to her true forte: jazz. Don’t miss out on this opportunity to see one of Buffalo’s best. Event link. 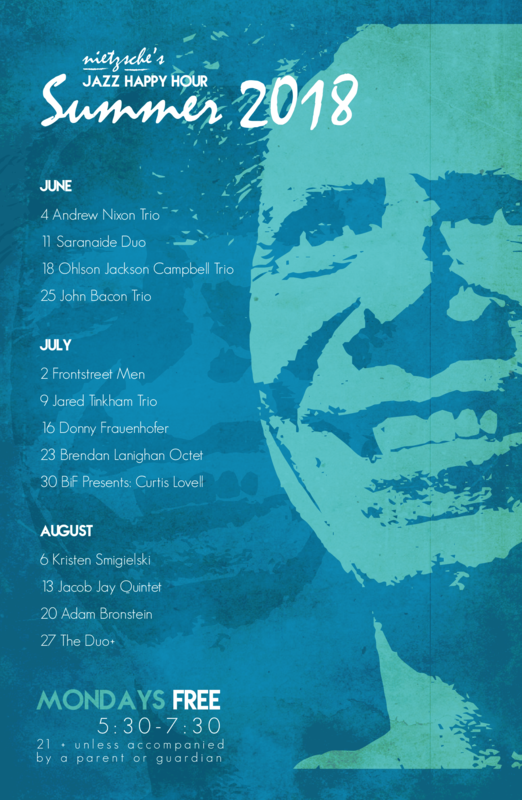 August 13th – No strangers to the New York State jazz scene, Dejesus and Warne Trio will be bringing their bluesy jazz style on the second Monday of the month. Event link. August 20th – Buffalo-based songwriter and musician, Adam Bronstein, will be making his way back to Nietzche’s and taking over Jazz Happy Hour on the 20th. Event link. August 27th – To end a summer full of the happiest of Mondays ,The Duo+ will be providing food for the soul in the form of their powerful performances of classics and new takes on old jazz standards. Event link. August 2nd – All the way from Portland, Oregon, do not miss your opportunity to spend the night listening to the rock and roll stylings of singer/songwriter, Jerry Joseph, as he performs with special guest Charley Orlando. Event link. August 3rd – Brooklyn-based Americana and alternative country band, Yarn, has brought crowds from far and wide to their shows and will be treating Syracuse to experience their music with special guest Old Dear Ensemble. Event link. 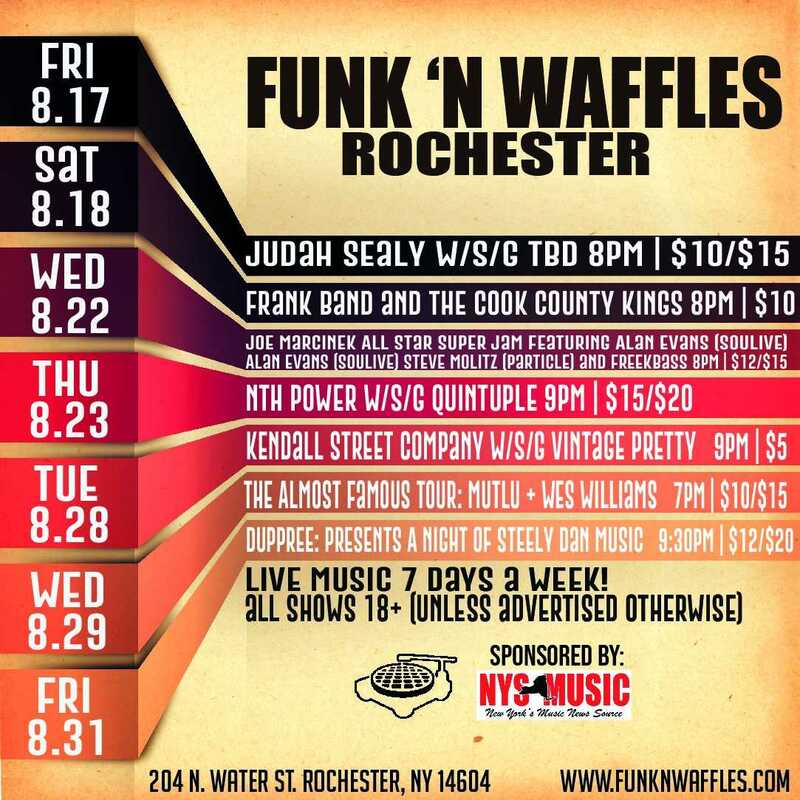 August 8th – For a night full of smiles and good vibes, Kendall Street Company will be stopping by on their Summer Tour at Funk ‘N Waffles along with Vintage Pretty. For fans of psychedelic, alternative and jam rock music and beyond, this show is sure to be a can’t miss event. Event link. August 9th – Handmade Moments will be bringing their rich, musical flavor of alternative folk music, paired with the diversely beautiful, “no rules,” sounds of the up and coming duo, Dizzy Heart. Event link. August 10th – There is nothing quite like a good night full of good ole Americana music, especially when it is delivered from Upstate New York favorite group, The Old Main. 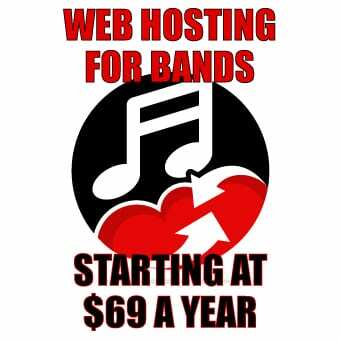 Did we mention it’s free? Event link. August 11th – Brutal By Design presents a night full of hot hip hop featuring Diabolic, Reef The Lost Gauze, as well as Syracuse-based musician, Timothy J. Event link. August 14th – The New Daze is reuniting for one night and one night only to revive their “organic psychedelic rage,’ for all those who have missed it so much. Make sure to make it out for this electrified performance as they are joined by Kansas Wine. Event link. August 16th – Delivering the sounds of the South right to your friendly neighborhood Upstate New York venue is just what The Prestage Brothers Band will be doing on the 16th of August. Event link. August 23rd – It is bound to be a packed night of out of this world music as alternative blues group, Late Earth, performs accompanied by the experimental sounds of The U.S. Americans, as well as Cosmonaut Radio.Event link. 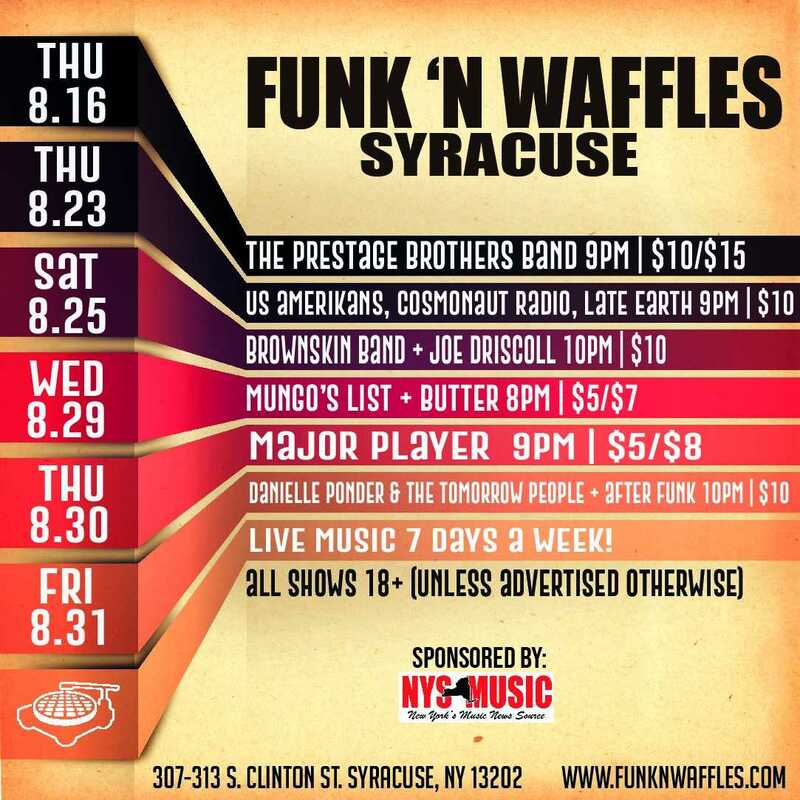 August 25th – Brownskin Band and Joe Driscoll will be taking over Syracuse’s Funk ‘N Waffles for a night that honors American folk in the funkiest way possible. Event link. August 29th – Mungo’s List covers it all and is sure to have a sound that will please fans of every genre from jam, to jazz, to soul, to maybe more niche interests such as “spacey,” music as well as, “spooky,” music. 6-piece funk band, Butter, will also be coming along to ensure that the funk is spread as much as possible to attendees of this sure to be memorable show. Event link. August 30th – Pop-driven, but diversely inspired group Major Player will be returning to their roots in Syracuse to perform in the place where their stellar sounds were born. Event link. August 31st – To end out an incredible month at Funk ‘N Waffles, Danielle Ponder & The Tomorrow People will be performing music that is sure to make you think, feel, and most importantly, dance. They will be joined by Candian funk, rock and soul group, After Funk. End your month with a bang and come enjoy the sounds of these two powerhouse groups! Event link. 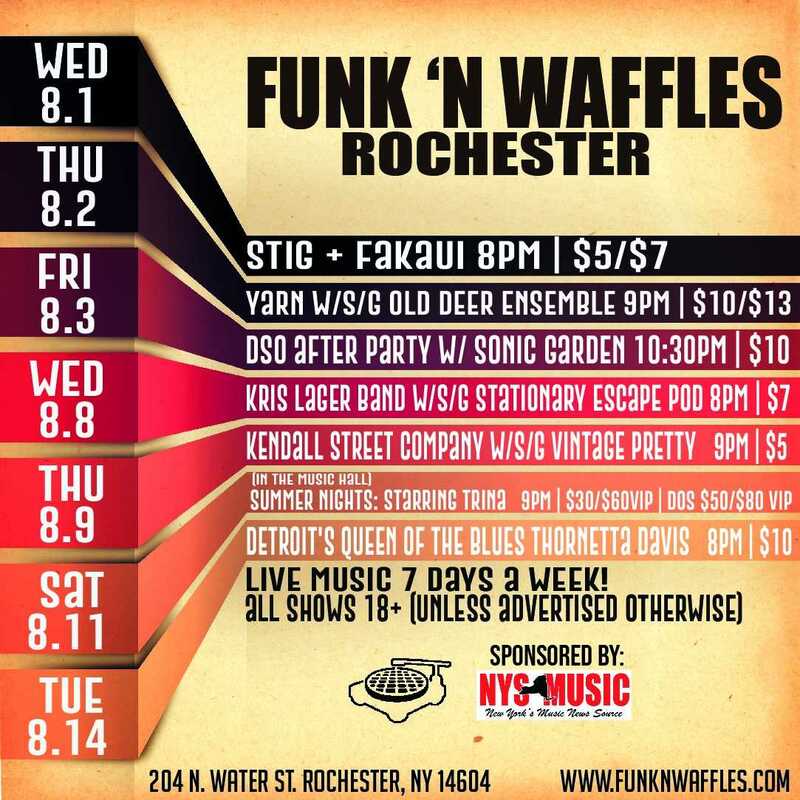 August 1st – Starting off month of August at Rochester’s Funk ‘N Waffles on a funky note will be groups Stig and Fakaui on the 1st. Event link. 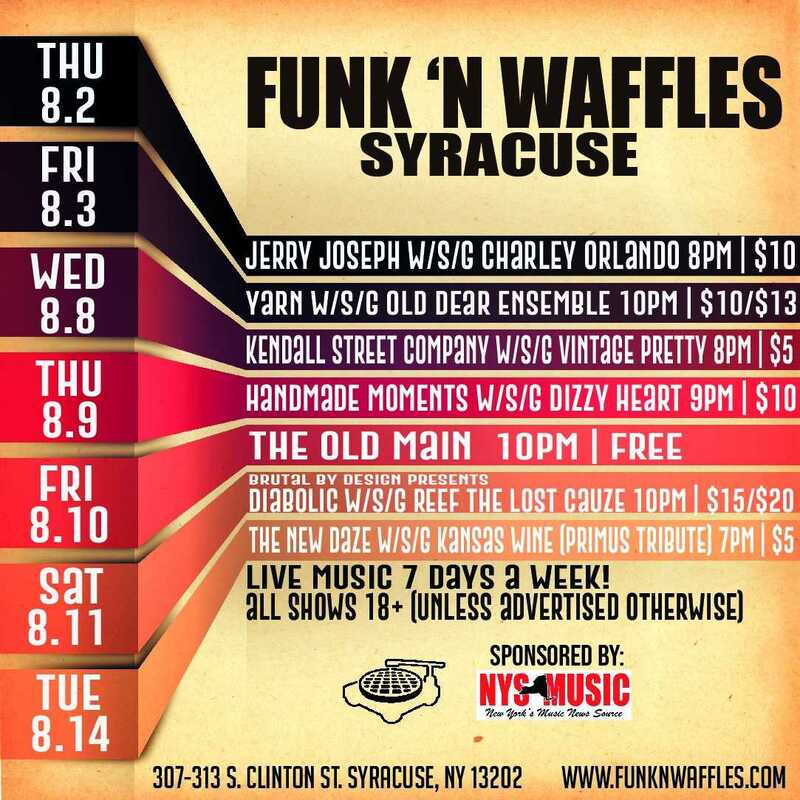 August 2nd – If you just cannot wait until Yarn and Old Deer Ensemble play Syracuse’s Funk ‘N Waffles on the 3rd or, better yet, just want to see them twice, come on out for their performance in Rochester the night before! Event link. August 3rd – Sonic Garden, Buffalo’s own authentic Grateful Dead tribute band, will be playing the DSO After Party. Come out to celebrate the music of an incredible band as this talented group of musicians revive all your favorites. Event link. August 8th – Kris Lager Band will be bringing revivalist rock and heavy soul to Rochester with special guest and Rochester-native group Stationary Escape Pod, who will be performing their blend of Americana, progressive rock, blues and more. Event link. August 9th – After the Kendall Street Company shows off their psychedelic funk with special guest Vintage Pretty in Syracuse, the next stop of their tour will be Rochester on the 9th. Don’t miss out on another opportunity to catch these two incredible acts! Event link. August 11th – Rochester Black Pride is proud to be bringing you Summer Nights: Starring Trina at the Music Hall. Trina is one of the most consistent and praised female rappers and will be performing her music that not only has been enjoyed by so many, but has done so much to change the world of hip hop. Don’t miss this opportunity to see her live! Event link. August 23rd – Nth Power will be bringing a spiritual, powerful, soulful and goose bump worthy performance with Quintuple and it is sure to be an uplifting experience you do not want to miss. Event link. August 14th – She is Detroit’s Queen of the Blues and she is coming to Rochester to show Upstate New York just why. Make sure to come experience Thornetta Davis live for an unforgettable and funky performance. Event link. August 18th – It is never a bad time for a Chicago Blues kind of night, and that is just what Frank Bang and The Cook County Kings will be providing on the 18th. Event link. August 22nd – Joe Marcinek All Star Super Jam is every last bit of fun that it sounds like it will be. As every one of their performances features different artists, this Rochester show will include Alan Evans of Soulive, Steve Molitz of Particle and members Freekbass. Event link. August 28th – To bring a healthy dose of reggae and blues for the month, Aaron Kamm and the One Drops will be performing with special guest Delilah Jones. Event link. August 29th – Continuing the reggae into the following night with a mix of R&B will be Mutlu, who will be coming through on his The Almost Famous Tour, with special guest and pop artist, Wes Williams. Event link. August 31st – The grand finale to such a grand month full of great performances will be brought to you by Kevin Kinsella. Come out for the last night of August and enjoy his acoustic soul and reggae sounds. Event link.